If there are two ladies in town who put many of us to shame, it is Gillian Lloyd and Janet Jackson! Both are in their 70�s and it never ceases to amaze us that whenever you spot either of them out shopping or on an errand in town, they are inevitably on their bicycles or walking! It is a rare sight to see them in a car during the day. Gillian says that she has opted for cycling over driving a car for as long as she can remember - since her early days at school and continuing throughout her years as a school teacher. Janet�s love of cycling really started in 1999 while on a cycling tour in France. On her return, she immediately invested in a bicycle and has loved it since. Aside from genuinely enjoying cycling, both agree that it is the most convenient conveyance, the cheapest form of transport, parking is easy and without a doubt it is one of the top ways � together with swimming and walking - to exercise and stay fit. 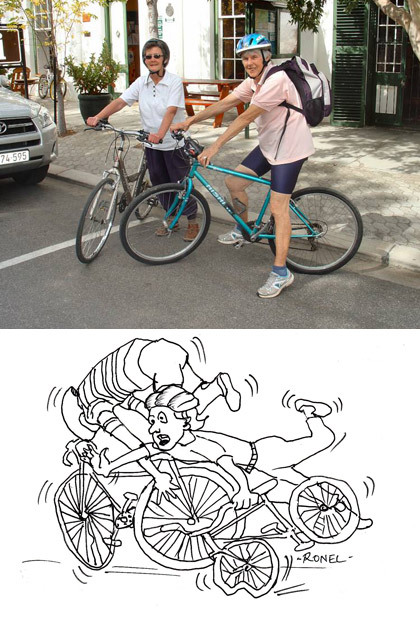 Both agree that in comparison to Europe, South Africa has a long way to go to cater better for cyclists. Shops for one should all try to provide bicycle racks and motorists should develop a more keen awareness of cyclists and motorcycles sharing the streets and roads with them. PHOTO: Gillian (left) and Janet (right) on their "steeds". Below that a cartoon depicting the mishap!